It is a great luck that the brides come to their weddings as the last ones, because they would not handel the general chaos that happens around the wedding catering. Catering agency never follows the timing during the preparations. It is a well-known fact. And then as a miracle, at the moment when the wedding starts, they are ready and everything is as it should be. In other words, you will not find anything wrong during the catering preparations. The bad color of the covers or tablecloths will be revealed easily and the world will not stop spinning because of that. But, if only 8 of the 15 planned waiters will arrive to work, and you will find out immediately when they serve the dinner with two plates in the hand instead of a theatrical performance of one waiter per guest, you will feel this mistake for the whole wedding feast. Soon you will notice that served wine is a few qualitative levels lower than you paid. And when the food presentation convinces you that everything will be perfect, it does not cross your mind that the waiters confuse the seating plan and serve a nut dessert to heavily allergic aunt. Think about the combination of the season and the selected dishes. Have a plan for the location of particular catering stations and timing. The sweet bar on the backround of the tree is a wonderful idea, but if you do it at 30 ° C, it could happen that your sweet bar will be beautiful only 30 minutes. Likewise, for summer weddings and garden parties the heavy meals are not suitable. Do not be afraid to experiment and include to the selection BBQ station or ice cream preparation in front of your guests. The more experiments, the more risks. The hot new product, the greater chance that the guests will not notice any deficiencies. It really matters when choosing a catering company. Most guests will remember just the wedding meal and its quality. It does not apply that the most expensive catering agency is also the best one. Previous tasting is necessary for your better feeling, but you yourself can imagine that eating a meal at a tasting for up to five people is quite different from consuming the food that was prepared for all 100 of your wedding guests. The same applies to inventory selection. The catering company will show you the least worn out pieces or just the once used only for the tasting show. If any of the above happens, you probably do not have the chance to fix it during the wedding, but strongly point out the deficiencies in front of the witnesses or in written form and complain about them after the wedding. If nothing else, you will feel a sense of justice. 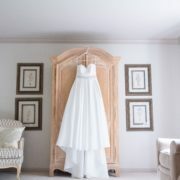 Almost every bride devotes considerable effort and time to the selection of dresses. They will bring them home with enthusiasm one or two days before Big day. From now the risk factors will begin to appear. I give brides advise to try their clothes in the salon and lock them in the vault after transporting home and under no circumstances come closer to them before accompanying the stylist on the wedding day. A taste once again (that means after a hundred times) see how awesome I look in the wedding gown or try to show it to the friends during/after a hen party is really not a good idea. 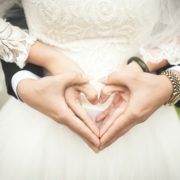 Whether the brides are more cautious, something always happens, and one more problem is added to general stress. It is good to have dress for change, and even this dress save immediately after rehearsal in the salon. There can be a lot of issues with the wedding dress. You’ve lost too much weight or contrary you got fat from all the stress and you did not try your dress in the salon before renting. When dressing up, you accidentally snapped a hook that safely secured covering of your breasts. Duringa very reasonable last meal before the ceremony, you droped a sauce on your dress. The answer is your main bridesmaid. It’s her duty to be prepared for these situations – detergents, needle and thread, a well-known tailor … whatever even she should secures new dress. Let her resolve the issue and you take a glass of champagne. 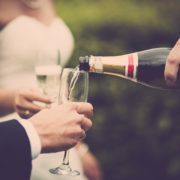 The wedding must be treated with the assumption that all guests are alcoholics, and in an indefinite moment they can reverse the course of things. I say that readiness. Each wedding usually consists of three phases. The first part is upon guests arrival. Families get acquainted. Guests are refreshed. This is the phase where the least likely to be threatened by the drunk guests who will demand a start of the party. But we must not underestimate it. It is enough that the groom’s group extend its own bachelor party till the wedding day, and that is likely to be a problem. What can you do? Include hostesses, promise them an extra bonus if they manage to make this group out of weddings in an absurd conversation. Ask the catering manager to serve them a ton of meat and a hectoliters of coffee. Command the best man to speak to them. The second part of the wedding is a feast. Here’s more risk. If you register a drunk guest, make sure he/she is not in the list of speakers or that he/she can´t self-capture the microphone. Talk to the waiter to give him/her to drink something similar in color but without a splash of alcohol. Give a drinker the person who will guard him/her and help with difficult tasks such as moving to the toilet and back. Continue in ambient music, definitely the DJ can not play anything that even looks like dance music. After the feast, the party begins. The percentage of drunkards is increasing. You can not do anything anymore, perhaps you are subliminally sending signals that you are ordering a taxi or water or taking a walk in the fresh air. It is very bad if the main wedding moderator is drunk. A man usually chosen by a groom. A person who enjoys a certain privileges, even though no one, including himself, understands the third announcement of the program. Either you have a second moderator’s backup or you have ordered a wedding coordinator and he/she takes over this honest job. The Wedding Coordinator is also good at ensuring that all guests come to their bed or at least to places where they claim to be overnight. From my experience, it’s a good idea to go round the last call through the garden, the basement, the toilets, catering facilities, the production room, the parking lot and the stairs and the ceiling. At the weddings of specific alcohol-related nationalities, I’m preparing a whole drunken backup plan and how many times I’m really grateful for it. Mothers are the main enemy of the bride. Everyone knows best how their child’s wedding should look like without noticing that their child is no longer a child, and the wedding is a proof of that. Mothers will very cautiously suggest a date with various reasons for example “your grandfather was born that day”, “date will be well remembered,” “I will just have after the surgery.” One hour after the date is set mother´s proposal for a wedding guest list will arrive by an e-mail and she will not be reluctant to prepare a seating plan. 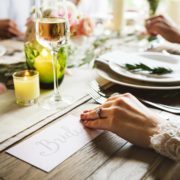 Even if you disable them – „them“ because not only bride´s mother, but also the groom´s mother will start sowing information to help you with the preparations. They are willing to produce invitations by hand, bake sweets, prepare floral decorations … basically they will want to do anything and to contribute their advice however you do not want to. Think of a strategy to get rid of the mothers, but not to insult them so much they do not want to arrive on your wedding day. I advise to my brides to come up with banal tasks for the mothers as were allocated to the groom, without any power to decide. In some cases, the groom can even decide independently. For example, about his bachelor party, after his plan goes through the censorship of the bride. If you do not intent any banal role, ask her to help own husband with the speech, because a dad will have to show publicly as a speaker in front of a large audience. For some, it’s a stressful experience for a rest of the life. But more about this topic later in the chapter of the speeches. Definitely consult with your mother her wedding dress. It’s more than practical advice. Just keep your mother as far apart as possible until your wedding day, then they become harmless and most of the time they will cry. Please, never forget to thank your mom in a right time in front of all the guests, otherwise there will be endless hell in every face-to-face encounter, when she will blame you for the rest of your life. I have met a bunch of moms who received the invitation with humility and enjoyed the mere fact that their children wanted them at their own wedding, without the necessity of self-realization in this event.